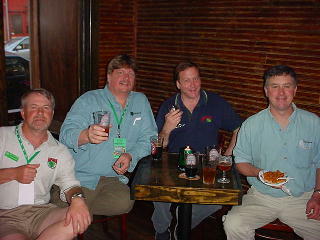 Owen Ogletree and Don Beistle were fortunate enough to have the chance to attend the 2003 Craft Brewers Conference and BrewExpo America held May 7-10 in New Orleans and presented by the Association of Brewers. The conference featured many informative guest speakers (some of which are pictured below) from the craft beer industry and attracted brewers and other persons involved in the operation of breweries and brewpubs from around the world. There were also exhibition booths with worldwide suppliers, including companies from the restaurant and brewing industry, who showcased their wares. A silent auction was held to benefit American Beer Month with brewery posters, t-shirts and more. 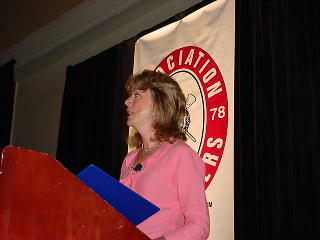 Kim Jordan of New Belgium Brewing Company, was also on hand to give an informative and uplifting keynote address concerning the current state and future of the craft beer industry. Along with the exciting happenings at the conference, we enjoyed visiting many of New Orleans' best places for beer (see the list below). Be sure to scroll down toward the bottom of this page to read Don's account of the delicious Dogfish Head beer tasting held at d.b.a. pub! Kim Jordan of New Belgium Brewing Company (Fort Collins, CO) gave an exceptional keynote address entitled "Brewing Good Stewardship in Your Community." This talk focused on how a microbrewery can foster a friendly, helpful relationship with the community in which it exists. Paul Gatza of the Association of Brewers filled the crowd in on all the details concerning the future, focus, and upcoming events of the association. The Craft Brewers Conference and Great American Beer Festival are two of the association's largest annual events. The lineup of presentations on Friday, May 9 included a panel on sustainability in the brewing industry. 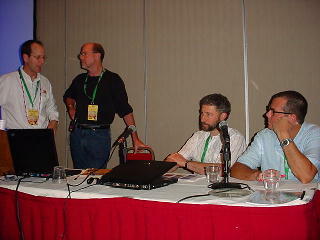 Methods of brewery waste management and recycling were discussed by (L to R): Morgan Wolaver (Otter Creek Brewing Company), Pat Conway (Great Lakes Brewing Company), Ken Grossman (Sierra Nevada Brewing Company), and Bob Johnson (Magic Hat Brewing Company). Head brewer of the Brooklyn Brewing Company, Garrett Oliver, delivered a mouth-watering presentation regarding the pairing of beer and food. No one is a better authority on the harmony of beer and food than Garrett. 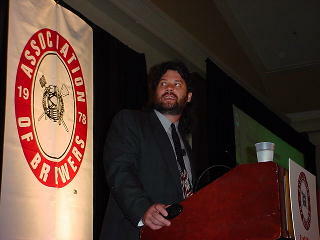 To see notes from his 2002 presentation, click here. 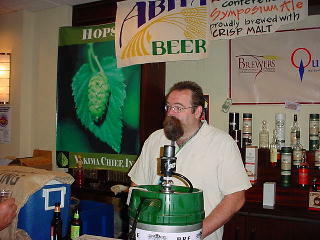 Many fine ales, lagers, and meads were available for sampling at the AOB's courtesy bar at the conference. Abita Brewing Company and Sierra Nevada (among others) were both able to show off some new brands. Pictured above is a representative from Weyermann Specialty Malting Company (Bamberg, Germany). Weyermann had an interesting display at the Craft Brewers Conference that included samples of all their current line of malts and a sample keg of Schlenkerla Smoke Beer from Bamberg. 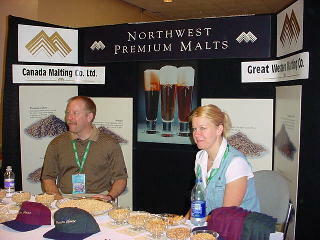 Northwest Premium Malts includes Canada Malting Company and Great Western Malting Company. 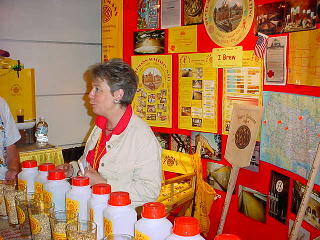 Their booth in the exhibit hall allowed brewers to taste and learn about new malts and specialty grains. White Labs provides some of the industry's best beer yeasts. 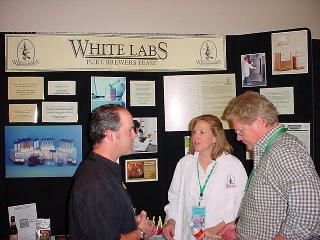 Many lab workers and yeast specialists from White Labs were on hand to discuss their products. Pictured above are representatives from HopUnion and BC Hop Farms Limited. These guys were always happy to discuss their hops over a pint of beer or two. Balcony Bar, 3201 Magazine Street. Bulldog Pub, 3236 Magazine Street. Carrollton Station, 8140 Willow Street. 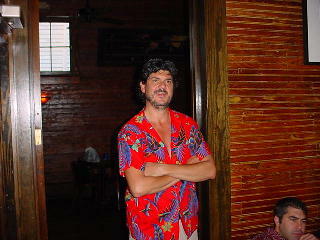 Cooter Brown's Tavern, 509 South Carrollton Ave.
Crown and Anchor Pub, 200 Pelican Avenue. 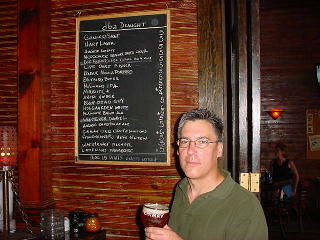 DBA Pub, 616 Frenchmen Street. O'Flaherty's Irish Pub, 514 Toulouse Street. Sidney's Wine/Beer Cellar (package store), 917 Decatur St.
Dogfish Head Brews to arrive. Dogfish Head Brewing produces some of America’s strongest, tastiest, most exuberantly eccentric beers. So it’s no surprise that when Dogfish Head founder Sam Calagione puts together a beer dinner, as he did at this year’s A.O.B. Craft Brewer’s Conference in New Orleans, the result is not your ordinary beer dinner. Rather than the usual modest samples of beer painstakingly paired to a half-dozen courses of chi-chi cuisine, Sam offered an audience of craft-brewing professionals full pints of his extraordinary brews accompanied by heaping servings of solid New Orleans fare. He even provided entertainment with dinner. 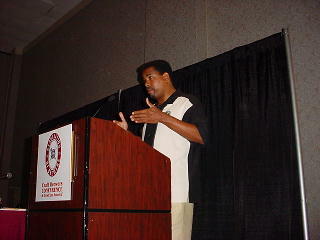 The event was hosted by Ray Deter’s d.b.a. pub (618 Frenchmen St.), a comfortably funky old storefront near the French Market that’s chock full of outstanding draft and bottled beers, and absolutely dripping with local color. A thirsty crowd of craft-brewers, easily recognized in their baggy cargo-shorts and beer t-shirts, began assembling an hour before dinner for drafts of Chimay and other gourmet brews rarely seen here in the South. 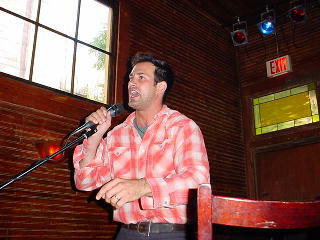 A few disbelieving patrons were seen rubbing their eyes later when Sam Calagione took the stage looking like Woody from Disney’s Toy Story. But Sam’s no toy cowboy. He’s a serious fan of Woody Guthrie, and he’s notorious for "channeling" the spirit of the Depression-era bard in a one-man dinner show that resembles nothing so much as a beer-soaked version of James Whitmore’s old Will Rogers shows. Between beer courses, Calagione sang Guthrie tunes that he had revamped to celebrate the joys and heartbreaks of making and drinking beer. The crowd at d.b.a. especially enjoyed his version of "Little Boxes," reworded to lament that pale, fizzy mega-brews "are all made out of ticky-tacky and they all taste just the same." The inspiration for the Woody Guthrie Beer Dinners is an anecdote that Guthrie once told about the time he and some friends tried to make beer. The results were, to put it politely, less than satisfying. Yet, Calagione can’t help wondering how different the world might be if Guthrie’s first (and last) attempt at brewing had been a success. "Just think," he urges, "what might have happened had Woody Guthrie become the father of modern microbrewing." Even if Guthrie’s beer had turned out, it’s unlikely that he would have gone on to create anything like the obstinately one-of-a-kind brews produced by Dogfish Head. For example, the first offering at the d.b.a. dinner was Pangaea, an experimental brew made with at least one ingredient from every continent but Antarctica. Golden hued, sweetish, and, at around 6% abv, a relatively light member of Calagione’s stable, Pangaea proved an excellent introduction to the Dogfish Head line. The evening’s most eagerly anticipated brew came next: the new 120-Minute IPA, a 21% abv monster hopped to a jaw-dropping 120 IBUs. Despite those intimidating numbers, the 120 IPA is exceptionally well balanced and easier-drinking than one would have any reason to expect. Next came Old School Barleywine, one of Dogfish Head’s winter seasonals (15% abv). Rich, dark, and bursting with malt and hop flavors, Old School also is surprisingly smooth in spite of its high-gravity intensity. Finally, the evening’s coup-de-grace was delivered by WorldWide Stout, Dogfish’s other winter seasonal, which, at 23% abv, is a contender for the title of world’s strongest beer. Full-bodied, intensely roasty, and swirling with complex flavors, WorldWide Stout is the ideal beer for sipping from a snifter while reading Kierkegaard on an icy winter night somewhere north of the Mason-Dixon line. But even on a sultry Spring evening in New Orleans its charms could not be ignored.